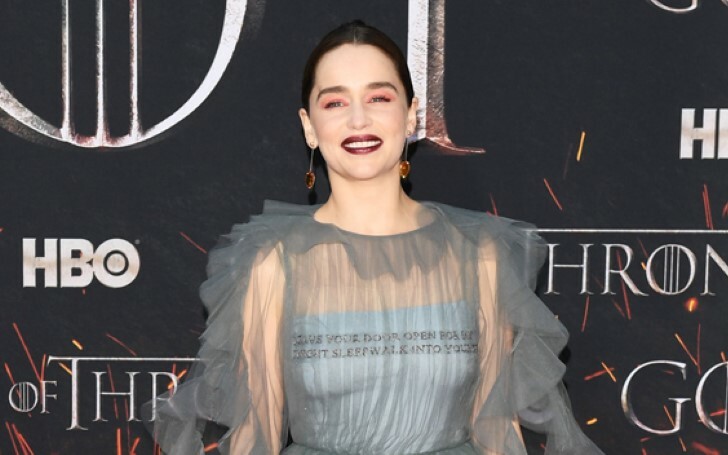 Emilia Clarke channeled her inner Mother of Dragons at the premiere of Game of Thrones as she hit the red carpet in a drop-dead gorgeous gown. On Wednesday (3rd April), all the cast of Game of Thrones attended the premiere of the series new season at Rockefeller Center in NYC. 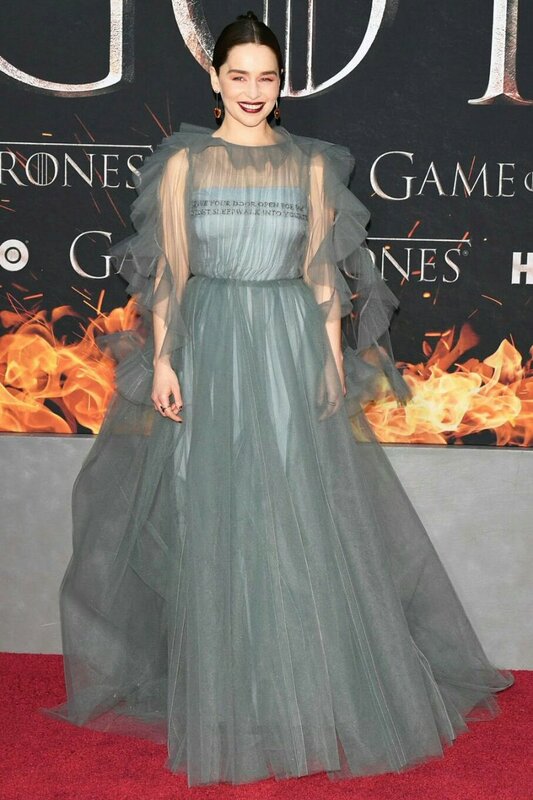 All the stars looked super amazing as they brought their A-Game fashion on the red carpet, and among them, one was actress Emilia Clarke. Like the usual, Clarke, who portrays the character of Mother of Dragons in the hit HBO series did not disappoint us with her fashion choices this time too. After seeing what she opted to wear for the event, it's obvious Emilia wanted to go for something big that would make all the eyes gaze only at her. Emilia Clarke at the premiere of Game of Thrones in NYC. As she hit the red carpet in a flawless dove grey princess gown, the 32 years old actress looked extremely beautiful. The dramatic gown worn by the British actress featured endless layers of ruffles and tulle around the neckline of the dress which overflowed down from her shoulders to sleeves. Adding more glamour to her naturally beautiful features, the Queen Daenerys rocked a dark pink lipstick and bright pink eye shadow which suited very well on her face. As for her hair, her hairstylist went for keeping her dark espresso locks slicked back with a middle partition that helped in displaying her unique makeover completely. 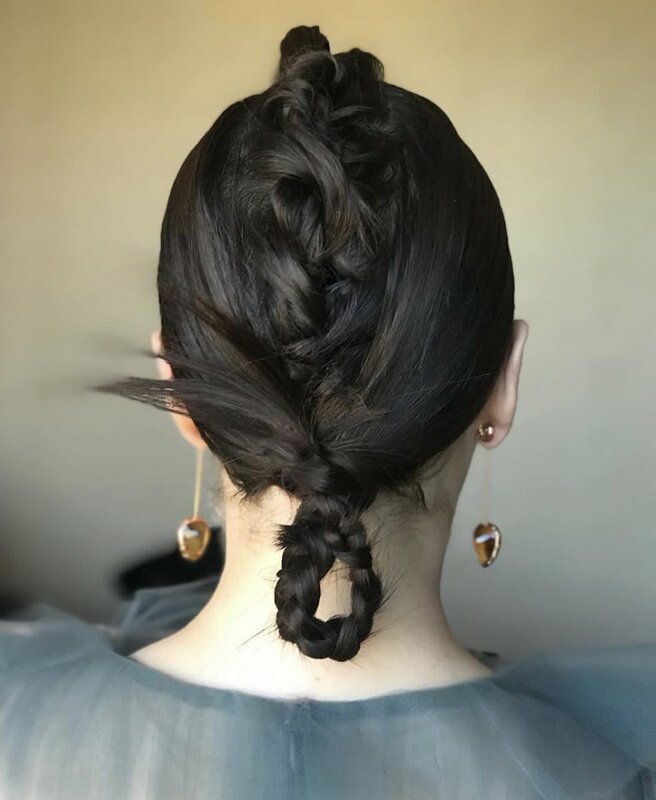 Interestingly the back side of hair was put into a GOT style braid. Accessorizing the elegant look with long earrings that included a shiny golden crystal hung on it and a collection of rings on her slim fingers, the star completed the red carpet look. In addition, her longtime stylist and friend Petra Flannery assisted the 'Me Before You' actress in styling the recent red carpet look. As for her makeover, the magic on her face was done by Jillian Dempsey whilst her matching manicure was performed by Jenna Hipp. Emilia looked super happy and excited to be attending the premiere as she waved and smiled at the fans and the photographers. The beautiful actress was later joined by her co-stars including Sophie Turner, 23, and Maisie Williams, 21, Kit Harington, 32, Rose Leslie, 32, Jason Momoa, 39, and Natalie Dormer, 37. Turner, accompanied by her fiance Joe Jonas arrived at the event in a cute little black dress that featured a deep plunging neckline. Moreover, she rocked a dark smokey eye makeover to match her LBD. Although the world premiere was held on Wednesday, fans will have to wait until 14th April to watch the last six episodes of the final series' which airs exclusively on HBO.